Terrific Tuesday to you all! School is in full swing and now this mommy has time to herself!!! Okay stop laughing, I have now been roped into being a class room volunteer! In the past I have been there maybe once a week for an hour or so but not this year! I am in one class for an hour a day. Then I go to another class if I have time.... THEN (Yes, remember I have 3 in my Tucker Tribe) I go to lunch with the Kindergartner... Sometimes I even end up in that class too!! I think I shall wear a cape and be called Wonder Mom! 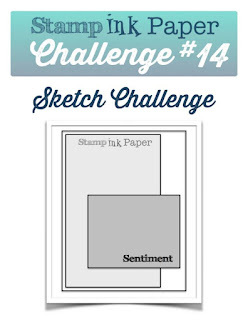 Click here for Challenge Details! 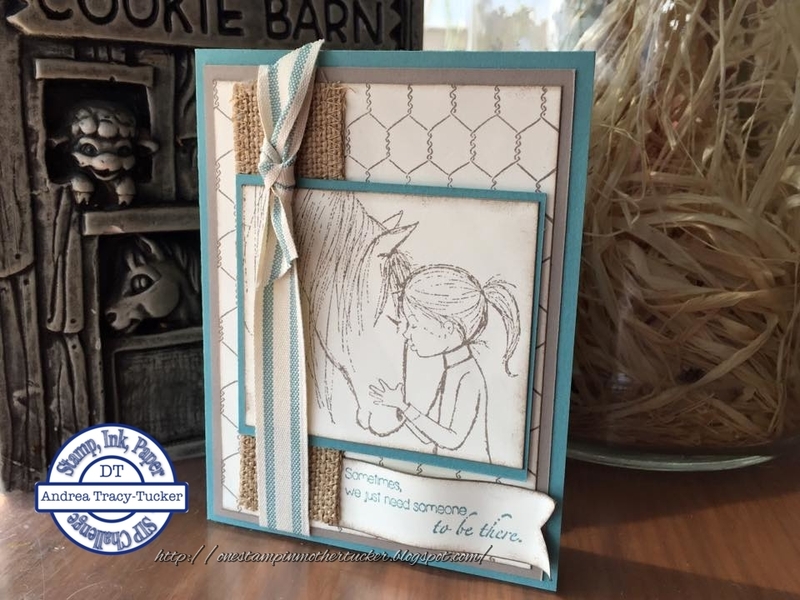 This great card started with a fabulous base of Lost Lagoon!! I have been neglecting some of my colors lately and it needed some love. I then matted my Very Vanilla with Tip Taupe this is stamped with an oldie but goody,vintage Stampin' UP! Chicken Wire Background stamp using Tip Top Taupe Ink. I then adhered the Burlap Ribbon to the left side of the card using Scor-Tape. I did this because sometimes I get a little too happy with the glue and oozes! Frankly the less messy the better (My mom would tell you that as a kid I could drink a Slurpee through a straw and STILL get it all over my face!). I then took the new In-Color 2014-2016 Ribbon and layered it over the burlap. The stamped Horse and Girl image in Tip Top Taupe is from Unity Stamp Co.. It is called Felt with the Heart it is designed by Phyllis Harris. This is one of many that I have of hers.... I LOVE THEM! 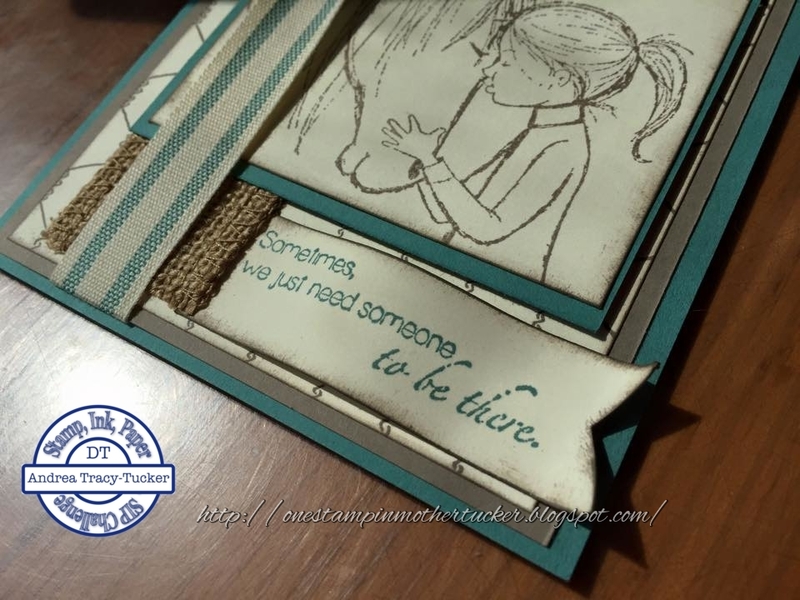 The sentiment which is shown closer below "Sometimes we just need someone to be there" is from another one of Unity Stamp Co and Phyllis Harris. It is called We Just Need Someone. I adhered the cute little banner using the 2 way glue pen. Thank You all for stopping in! I am really looking forward to seeing your creations!! Your card is so you! A girl and her horse and the emotion is in the stamp of how they feel about eachother. Cute! Oh what a sweet image, and the sentiment is wonderful! The chicken wire and burlap is just perfect, too. Great card, Andrea.